The answer to this question is easy: Sure you can… maybe. In many ways, the literalist isn’t far off. Of course you can. There’s guys who will be in churches all across the world this weekend using a Fuzz pedal. I’m hard pressed to think of a piece of guitar gear that hasn’t been used by someone at some time for the purpose of leading people in worshiping God. So maybe the question isn’t so much Can You do it as much as it is Should I? I can’t answer that for you. I have a fuzz pedal on my church rig. I know that I could use it at my church but if I went to another church, the answer could be very different. The “Should You” question is really divided into two parts. The first is “Does a Fuzz pedal fit with the worship expression and culture of my church?” I can’t answer this question for you. You as a worship leader need to know your church family well enough to make that call. If you’re in a more conservative church where a TS9 is forbidden, its probably a good chance that the answer is no for your church. But that doesn’t mean its know for another church. The second part of the “Should You” question is “Does a Fuzz pedal fit with the song we’re playing”. This second part will actually help you answer the first part of the question. If a fuzz pedal doesn’t fit any of the songs you are playing musically, then it is highly likely that the answer to the first question is NO. But not always. For example, I could see a church that is very forward thinking in its musical expression where a fuzz pedal still wouldn’t be the right call. Hillsong or Jeremy Riddle might now need Fuzz musically, but that doesn’t mean that those churches would be opposed to Fuzz on principle. You don’t see Jack White using a lot of delay pedals but that doesn’t mean he thinks they’re evil. But assuming that you’ve asked yourself both “Should I” questions and found the answers to be yes both times, you’re still left with the real question: how to? 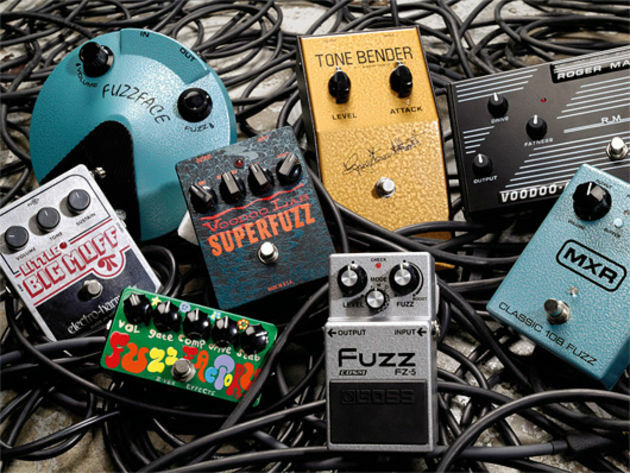 1st off, Fuzz pedals are like any other guitar effect; they come in all shapes and sizes. Tonebenders and Muffs. Germanium vs Silicon transistors. Op amp, Bit Crushers, and more Fuzz Face clones than you can shake a stick at. 2nd. More than any other effect pedal that I can think of, a Fuzz pedal interacts and reacts directly and in direct response to your guitar, your playing, and your settings. These two facts are important to know because you could pick up a Fuzz pedal like a Bit Commander that wouldn’t work at all in 99% of all Church situations, or a Fuzz Face style pedal that needs your guitar’s volume to be cranked to really get that “fuzz tone” which again, would be an issue for most church players. So I tend to look for Fuzz pedals that I would describe as “musical” or “melodic”. I’m looking more for a warm sustain than a gnarly deconstruction of my sound. I get around the volume Issue with my Jazzmaster’s Rhythm circuit, but you could pull off the same trick with a Deluxe Telecaster, Grestch or Les Paul where you have independent volume controls for each pickup. Practically, I use a Fuzz pedal in two ways. 1st is for lead work. Single notes as opposed to chords or arpeggios. 2nd, If I’m playing a full chord, I let it ring out to add texture to the sound. In this method, I’m letting the fuzz’s sustain do all the work and I try not to muddy things up with more playing than I need to. Also, you could layer reverbs, delays and modulation together to take the “edge” off the Fuzz and create some very cool atmosphere. This is also where a pedal like the Bit Commander or any Bit Crusher style fuzz might actually work in a church setting if done right and in a very controlled way. For those of us who are gear heads, it’s always good for us to remember the point of playing in Church. We are serving Jesus and his church by creating a platform for people to connect in worship and prayers through song. So if that really cool Fuzz pedals takes away from that platform it’s got to go. But, if we can use the creativity God gave us to find a way to enhance or build up the Church’s worship platform, then godspeed. For those who are critical of gear and big bands and just want “simplicity” in worship I would say this: Some of the worship the Bible describes in Heaven is far from simple and is actually quite complex. The truth is that what you describe as a desire for “simplicity” in worship is really a personal preference for a more laid back style or expression. There’s nothing wrong with this, it’s a perfectly valid opinion. But, if you hold that opinion, the chances are that you are part of a church who’s culture and expression would lead a worship leader to answer No to the “Should You” questions. But whether we worship Jesus with or without Fuzz pedals, let’s do so in Spirit and in Truth with Unity for we are all of the same Spirit and bought with the same blood. I have a wampler LEVIATHAN and a JHS Astro Mess , which I think can be set up to sound more like overdrives. However, pedals like the Muff series are difficult to tame in my opinion.